When I step into the kitchen around Christmas time, I can’t help but think about my mom. Between her job and running my brother and me all over town for our eighty bajillion different activities, I have no idea how she managed to churn out so many amazing treats for the holidays. Her peanut butter fudge was legendary, and it’s by far the most popular recipe on my site. She made dozens upon dozens of peanut butter cookies, then took them to the next level by dipping them in chocolate. Did she ever sleep? I couldn’t resist following in her footsteps once again. I simply had to have these cookies. Peanut butter and chocolate is like heaven. And shock of all shocks, they’re actually easy to make. 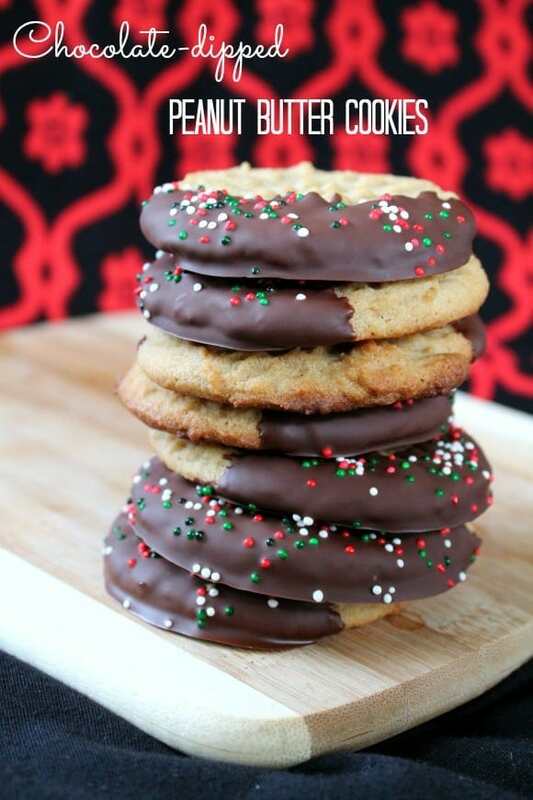 The cookies themselves are chewy and sweet, and the dark chocolate provides the perfect deep contrast. Also sprinkles. Because Christmas. All I did was bake up a batch of my favorite peanut butter cookies, melt some dark chocolate with a drizzle of vegetable oil in the microwave, then dip and sprinkle to my heart’s content. This project could definitely benefit from some extra hands. It didn’t take me terribly long, but it would have been more fun to have some other dippers to play along. Can’t hurt. 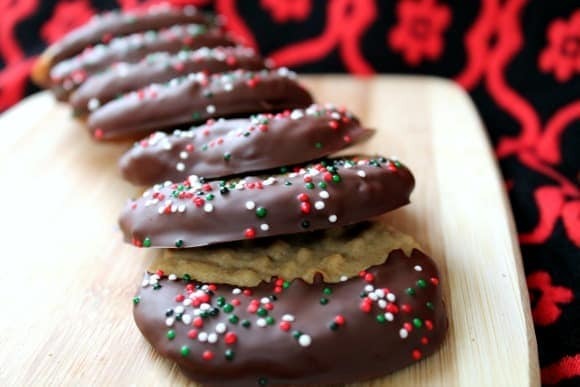 Please please please make these chocolate-dipped peanut butter cookies. They’re so awesome. They need to become one of your holiday traditions. In a large mixing bowl, beat together peanut butter, butter, brown sugar, milk, and vanilla until well combined. Add the egg and continue beating until everything is smooth. In a separate bowl, combine flour, baking soda, and salt. Stir together for 30 seconds. With your mixer on low, slowly add the flour mixture and beat until everything just comes together. Scoop out your dough about a tablespoon at a time, leaving space for the cookies to spread. Gently press two fingers into the center of each dough ball to help flatten it. Bake for 8 to 9 minutes or until the cookies just barely start to brown around the edges. Let the cookies cool on the baking sheet for about 3 minutes, then transfer to a wire rack to cool completely. When the cookies are cooled, melt your chocolate with the vegetable oil in the narrowest container you have that you can still fit a cookie and your hand inside. I used the microwave. Just stop and stir your chocolate every 30 seconds until it's smooth. Dip each peanut butter cookie into the chocolate and allow the excess to drip back into the bowl. 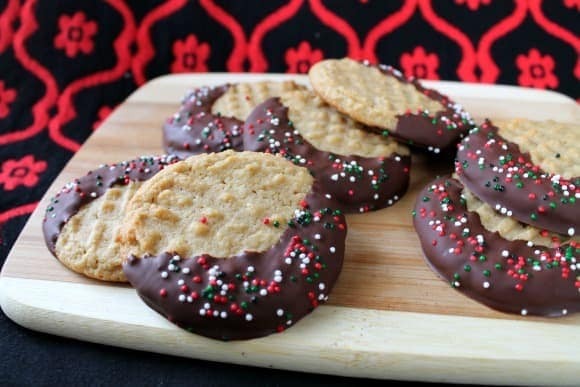 Place your cookie on wax paper and add the sprinkles while the chocolate is still melty. I had to put my cookies in the fridge to soften, but my kitchen is very warm. Still, it couldn't hurt. If your kitchen is quite cool, you may be able to leave them on the counter. Once the chocolate is set, you can serve these to your friends and family any chance you get. Be sure to check out all of the other great recipes from today’s Christmas Cookie Party hosted by Amber at Rick A Bam Boo!